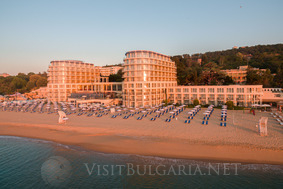 Location: Azalia Hotel & SPA is located on the Northern Black Sea coast in St. St. Constantine and Helena Resort. The hotel offers comfort, tranquillity and excellent opportunities for an unforgettable holiday. It is a modern hotel complex offering a unique combination of alternative architecture, spectacular sea view, golden beaches and spas. Accommodation: Azalia Hotel & SPA offers its guests 235 seaview double rooms, with central air conditioning enabling individual adjustment of the temperature. The 9 floors complex is “Four-star plus” category and there is a panoramic elevator and a chopper landing place. The room furniture matches all the requirements of the modern tourist. Wine & dine: Azalia Hotel complex offers a stylish main restaurant with capacity of 290 seats indoors, and 120 on the open-air panoramic view terrace located right above the sea waves. The menu includes modern national and continental cuisine. Spa & wellness: The SPA & Wellness Centre of Azalia Hotel is a place where to escape from the daily stress and exertion. You can enjoy more than 60 procedures, massages, therapies and programs. It meets all SPA and balneological requirements and offers the best SPA cosmetics brands as Pevonia Botanica, Thal'ion, Kneipp и Rior. The SPA Centre has a massages rooms, a new generation of bubble baths with anatomic design for underwater, whirling and pearl massage. In the procedure`s area a qualified staff will offer you the best beauty treatments, face, body and overall health care. Azalia Hotel & SPA has three outdoor swimming pools and one children pools with a total of 1,400 m 3 of crystal clear curative mineral water. There is two water slides at the outdoor pools. The Jacuzzi pool is the perfect place to relax before or after a spa treatment. Meetings & events: Azalia hotel & SPA provides one fully equipped hall – “theatre” type, flexible for different kind of special and business events with capacity of 100 people.